Who doesn’t like professional looking PowerPoints? But, formatting PPTs can often take hours and in the end, your PowerPoints could end up looking, well, just like everybody else’s. How about outsourcing the design of your corporate PowerPoint presentations to India so you can focus on the content side of things? Sounds like a great idea, doesn’t it? Unfortunately, too many people had the same idea at the same time. 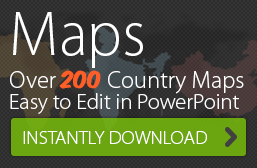 More demand led to abundant supply and today, a Google search for “Outsource PowerPoint Services to India” brings up dozens of PowerPoint service providers. How do you wade through this list and pick the right PPT provider for your needs? You can begin by looking at seven habits of highly effective PowerPoint service providers. Knowledge and Understanding: Effective Powerpoint service providers know what exactly you are looking for, as a consultant or a business professional. They can capture all the nuances of your project by asking the right questions.Whether it means using custom animation techniques or working with graphics and media settings or using features such as Live Desktop Presentations, Pack and Go and Easyscreencapture or customizing clip Art and AutoShapes, a good service provider is familiar with the most complex techniques for creating PPT presentations. It is of course, not enough to be familiar with these techniques. Effective Powerpoint service providers know where to use each power-user technique to create the best overall effect.Let us just say they know what makes a PPT work. File naming conventions and version control: When creating a PPT, you invariably end up with multiple versions and trying to keep track of multiple files is always tricky. Effective PowerPoint service providers have their own organized approaches to tackle version control.They are also familiar with any file naming conventions that save busy business consultants a lot of trouble, for instance saving a file as a .ppt file vs a .pptx file or using a descriptive PPT filename. Ability to set tone with templates and Effective selection of images: The design of your PowerPoint slides is the first thing your audience notices, even before your presentation begins. An effective Powerpoint service provider knows to set the right tone for your presentation with a professional template.Yes, pictures speak a thousand words, but an image that is not used well, might stick out like a sore thumb. Effective Powerpoint service providers know to use images, clipart, arrows and diagrams to add life to the content. They know to merge images with their backgrounds, so they fit into your PPT presentation seamlessly. Attention to detail and an eye for design: Less is always more in a Powerpoint presentation. A good Powerpoint service provider understands this and can create a professional and elegant-looking PPT instead of a flashy presentation that distracts the audience from your key messages. Ability to enhance visibility: Using solid colors on plain backgrounds, choosing attractive fonts, altering the font of the words or sentences you want to emphasize and using the right sized fonts can make a huge difference. 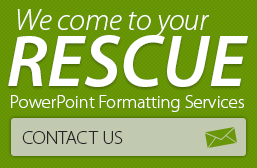 An effective PowerPoint service provider knows to use fonts to highly enhance the visibility of your PPT presentation. Effective use of SmartArt: Slideshows often list points or facts, usually in bullet form. But everyone knows that bulleted lists are recipes for monotony. It might be a good idea to give the audience a graphic representation of the bullets just to add some zing to your PPT. SmartArt can do just that. An effective PowerPoint service provider knows to use SmartArt to enhance any text placeholder containing bullet points and draw diagrams that explain concepts instead of just listing them one after the other. 24 hour turnaround capacity: Creating insightful PowerPoints full of complex data and diagrams is hard enough. You often do not have hours to spend making aesthetic changes to your PPTs. Using a PPT service provider who offers quick turnarounds can speed up things significantly. By using various techniques such as using in-house image libraries and reusing previous decks and slides, an effective PPT service provider can send a refined Powerpoint back to you in 24 hours. Read more about 24.0 and our PPT services. Are we effective? Yes, indeed. Of course, you don’t have to take our word for it. You can look at a few sample PPTs refined by our team. Or see what our clients say about us. Even better? Contact us today to try us out.